The CPCC’s mandate includes advocating on behalf of recording artists, songwriters, publishers and record labels for their rights as they pertain to private copying. The private copying levy was first established by the Federal Government in 1997. Currently the private copying levy applies to CD-Rs at a rate of .29 cents per CD-R. But we all recognize that today most people make copies of music on their cell phones and tablets. And music creators are NOT being compensated when copies of their music are being made onto these types of devices. Revenue from the private copying levy is rapidly declining as consumers embrace new technologies for making private copies of music. The CPCC, along with its member collective organizations, has been strongly advocating for changes to the Copyright Act and lobbying the government to ensure that music rights holders’ interests are being represented. The Copyright Act must be brought into the modern age, by extending the private copying levy to the current technologies that people are using to make private copies of music. CPCC representatives appeared before the Standing Committee on Canadian Heritage on May 29, 2018. You can read a copy of our full remarks or listen to the appearance on ParlVU. CPCC representatives appeared before the Standing Committee on Industry, Science and Technology on Thursday, June 14, 2018. You can read a copy of our full remarks or watch the appearance on ParlVU. 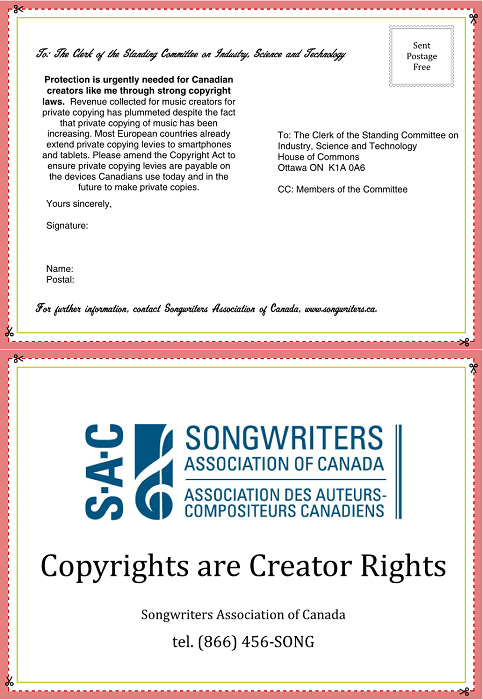 The Songwriters Association of Canada has been encouraging supporters to sign and send pre-printed postcards addressed to the Clerk and Members of the Standing Committee on Industry, Science and Technology asking for the Copyright Act to be amended “to ensure private copying levies are payable on the devices Canadians use today and in the future to make private copies.” Contact the Songwriters Association of Canada for more information or to participate in the campaign. In January a letter signed by 15 organizations was sent to Ministers Morneau and Joly urging them to include an interim Private Copying Compensation Fund in the 2018 Federal Budget. As a Fund was not included in the 2018 Budget, CPCC submitted its recommendations to the Standing Committee on Finance for Budget 2019. CPCC is now on social media! We have created accounts on Facebook and Twitter and will be posting throughout the Copyright Act review that continues this fall. Follow our accounts to stay informed on the review and our activities!